Description: It is a perennial herb with several erect stems emerging from a taproot in the sand, their base buried beneath the surface. 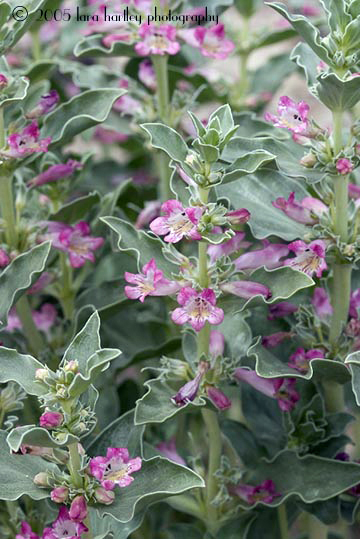 The stem branches are hairless and somewhat waxy in texture, reaching up to about 35 centimeters tall. The inflorescence produces several purplish-pink tubular flowers between 1 and 2 centimeters long surrounded at the bases by toothed, white-edged sepals. The flower has some hairs in the mouth, but the sterile stamen is hairless. The flowers are pollinated by vespid wasps and probably other insects, such as carabid beetles. Leaf: The oppositely arranged leaves are oblong or widely lance-shaped, pale green edged in white, and up to 5 centimeters long. Notes: This photo was taken on April 7, 2005 on National Trails Highway near Pisgah Crater, San Bernardino County, California. 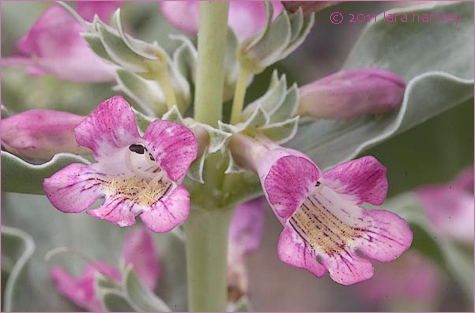 For more information www.blm.gov/ca/pdfs/cdd_pdfs/whitemarg1.PDF Penstemon albomarginatus is a dicot that is native to California and to Arizona, to Nevada. It is included in the CNPS Inventory of Rare and Endangered Plants on list 1B.1 (rare, threatened, or endangered in CA and elsewhere). Distribution outside California: Nevada, Arizona.